Not all animals shot, end up on the hunter's plate. Retrieval rate is a percentage of animals recovered after being shot during a hunt. Most animals will be caught. Others, however, are severely wounded and escape only to die slowly and painfully. Deer are especially susceptible to such scenarios. These animals have learned how to duck immediately they hear the bowstring snap. It is, therefore, crucial to every hunt that hunters know where to shoot a deer with a bow to kill it instantly. Deer hunting with bows is a favorite recreational activity. It is also encouraged by conservationists to regulate deer populations. Bow hunting can, however, exhibit very high wounding rates. 18% is the average Wounding Rate among bow hunters. The number expands to over 50% among novices. The difference is brought about by one simple fact. Most novices do not know where to shoot a deer with a bow. The overall effect is a loss of hunts and inhumane kills. N.B. : Wounding rate is a percentage of animals shot but not recovered. Lowering the Wounding rate should be a top priority for every bow hunter. As such, all should know where to shoot a deer with a bow. Pro Tip : To minimize the wound rate It is essential to get a good quality of deer hunting crossbow or top notch compound bow along with the crossbow scopes. Because the selection of best quality bows and scopes is more than essential for killing the deer instantly than just hitting a deer randomly. Right now I am using these two crossbows for my everyday hunting. They are awesome and robust with having top notch features and offers a great value for the money. Also you can use the best rangefinder binoculars (Not essential) to calculate the range and distance of your target for a perfect shot. In addition you can use best ground blind for hunting so that you can concealed yourself and minimize the wound rate and can shoot the prey accurately with perfection. Let's First learn What are the main area to shoot a deer with a bow then we will move on to why it is so important to learn Where To aim on a deer with a bow. If you in hurry and just only want to know only the specific place where to shoot a deer with bow, then jump there easily by clicking the "Deer Hunting Bow Tips" tab from the quick reading section. The Importance of Reducing Wounding Rate? How Do The Two Bows Compare On These 5 Vital Areas? N: B. If you are a professional hunter and want to roam in fields at day and night without damaging your feet like me then you must need the best rubber hunting boots. Because it is very likely to happen when you have to stay a long period of time in the open cold freezing field. if once frostbite happened due to non-insulated boots it will become a disaster to any hunter. Also while hunting at night it is essential to have a good pair of best night vision binocular. A night vision binocular will become handy when you have to scout your hunting area and target you prey. I have Sightmark Ghost Hunter 2x24 Night Vision Binocular which is an awesome addition in my arsenal. With it built in Infrared illuminator I can see my target clearly even at the dark night. So if you are prone hunt at night or planning then I will advise you to choose a great night vision bino so that you can target and aim your prey more precisely even at dark night. One thing to mention these night vision binos are not so cheap like the binoculars under 100 dollar Or our list of best binoculars under 200 dollars. A medium - good or professional military grade NVD starts from 400 - 6000 usd so keep that in mind. The ranges of bows are small. On average, you can only shoot deer at 40 Yards. The closer the deer, the more effective the shots. I will divide these tips into two large categories. How To Get Close Shots. Where To Shoot A Deer With A Bow. Always remember that bows are only lethal at certain ranges. It is, therefore, crucial to know how far to shoot a deer with a bow. N.B. : 25-35 Yards is the optimum distance while bow hunting deer. Deer rely heavily on their noses. To catch them by surprise, you will have to be without scent. You cannot 'really' be scentless, so you do the next best thing. Make sure the deer cannot smell you. How do you do this? Hunt against the wind. The wind will carry your scent further from the deer. It is a neat trick, and it has worked for predators like the lion for eons. Use a scent masking soap to shower. You should also carry an odor mask with you. Favor your head and hair in when applying the mask. AVOID TOTALLY all scented soaps and lotions. Smoking, chewing gums, and other such habits should be avoided. The Best Tree stands keep you hidden. They also keep your scent from reaching the deer. Deer will almost always find their way to a well set up tree stand. The bird’s eye view, however, offers another challenge. You can gaze down deer for hours on end without getting a kill shot. DO NOT shoot just because a deer is in view. You need to know how to shoot a deer from a tree stand. The trick is patience. Lots of patience! When it is close to the mating season, doe scents around your stand will attract bucks. At any other given times, use the buck’s territorial instincts against it. Use some buck scent around your tree stand. The alpha buck will come out to defend its territory. Avoid directly overhead shots, as tempting as they may be. The heart region is still where to aim on a deer with a bow from a tree stand. Wait until you get a side shot of the heart region. Deer attractants also keep deer off your scent. Once their breeding or fighting instincts are triggered, caution is thrown to the wind. Your scent will not cause the deer to run and hide automatically. Where to shoot is the most important aspect of the hunt. It is better to return home with a full quiver than to wound and not kill. Accuracy is critical in any hunt. The rated efficiency of the equipment is, however, not as important as the precision of a hunter with the equipment. Many have asked me about the best deer head shot bow or the best high shoulder shot deer bow. The truth is that there is no universal answer. A bow is an intimate piece of equipment. Find one that works with you and for you. There is no universal fit when it comes to bows. Compound bow hunting tips and deer hunting with a crossbow tips are in agreement on this one. The broadside exposes all the vital organs to your arrow. a. The shot is still lethal even if the deer jumps the string. Missing the heart still, punctures both lungs and major blood vessels. b. It does not destroy large venison portions. c. Tearing the blood vessels bleeds out deer. Their meat tastes better as a result. This shot is another good one. Deer walking past your tree stand leisurely is the stuff of fantasy! Deer will give this shot mostly just before daybreak or late evening. Whitetail deer is especially fond of low-light feeding. If you were wondering, 'When is the best time to bow hunt for deer?' There you have it. Evening and daybreak are the best times. Practice shooting under low-light. The skill will come in handy. I usually discourage head shots on deer. Jumping the string, usually, sees arrows deflected and deer injured. In the case of the white tail, set up before low light and wait. Wait until you get a broadside shot or a quartering away shot. That is how to hunt whitetail deer with a bow. Deer shot in the head with a bow will die immediately. Instant death is, however, not always the case. The head is bony and can easily deflect arrows. When on a tree stand, only take the shot if you are sure of your aim. You are an excellent shooter. The deer holds its head still for a long time. It is a follow-up shot. These shots only hurt the deer. The vitals are all well protected by bones from a frontal penetration. This shot is the most tempting for tree stand hunters. The deer is so close you can jump onto his back! Unless you can hit the head or split the backbone below the neck, DO NOT TAKE THIS SHOT! A shot to the chest cavity will probably deflate a single lung. The deer will still be strong enough to run only to die a slow and painful death. Only take this shot if the quartering angle is not too sharp. Patience usually improves this shot. It slowly becomes a broadside shot if you wait silently. The trick is to wait without making any sudden movements. Good luck fighting the adrenalin rush if you are a novice. As you can see, knowing where to shoot a deer with a bow is beneficial to both you and your prey. Practice these kill shots to perfection. The meat will be better, the hunt quicker and the deer's death more humane. When a deer is shot, its first instinct is to run for safety. A well-placed shot kills it before it gets very far. The best angle to shoot a deer with a bow is one that allows for a quick kill shot. A misplaced shot will see the deer run to other deer. The sight of another deer with an arrow on its side spooks all other deer. Hunting deer with bow is a very delicate affair. You need to get a perfect shot before firing your arrow. For a perfect shot, the deer needs to be relaxed. Feeding and drinking time is the best time for such shots. 9 out of 10 of all deer hunting bow kills are taken at this time. Spooked Deer is almost impossible to target. Once spooked, deer run away. It is very hard to place a kill shot on a running target. Bow hunting demands that you wait until your prey is stationary. Only then should the shot be taken. That is how to shoot a deer with a bow! Less than 15% of bow shots taken on moving targets result in a kill shot. Animal rights activists hate all forms of hunting. Bow hunting is especially despised. Many consider it to be torture. If you have ever seen a deer shot on the stomach, you will understand their concerns. a. There is the best spot to shoot a deer with a bow. b. There is the worst place to shoot a deer with a bow. Every deer hunt with a bow must put these facts into consideration. The best spot is one that leads to a quick death. These spots result in the rupture of vital organs or blood vessels. Death usually follows with minimal discomfort on the deer. A bad spot is like the one mentioned above. The stomach! These shots do not tear any major organs or vessels. If death should follow such a shot, it is usually prolonged and painful. In such a scenario, I recommend a quick follow-up kill shot. Things are, however, not always that easy. Deer flee after wrongly placed shots. Finding them is difficult. They end up suffering while well hidden from the hunter. To make the hunt more humane, it is crucial you know the best shot placement for deer with a bow. The best place to shoot a deer with a bow is one that will not destroy meat portions. Shot placement on deer with a bow should put this into consideration. Venison also tends to sour when it has too much blood. A shot aimed at the major vessels lowers the amount of blood in deer meat. There are kill shots that will not tear vital blood vessels. The brain and spinal cord are such spots. Though brain shot is tough! If, however, you want good venison after the hunt, avoid these shots. Look at any 'where to shoot a deer with a bow diagram.' You will notice a concentration of kill spots around the heart. The shot should, however, be taken from the side. The spaces between the ribs offer openings to the zone. This zone is of particular relevance to venison lovers. A shot aimed at the heart will almost always tear up a major blood vessel. Let us delve into some quick biology. The Aorta is the biggest artery while the Vena cava is the most prominent vein. Tearing any of them will see the deer lose a lot of blood quickly. Consequently, the venison will have less blood. The lungs also collapse and result in a quick death when punctured. Good bowhunting deer tips should result in quick kills. Of all the tips you can apply, pay close attention to the 'where to shoot deer with bow. The skill to place a shot is what sets expert bow hunters apart. The converse is true, even with the best equipment; a misplaced shot will not kill deer. So what do I mean? Does equipment matter or does it not? Equipment does matter. The 'how to use' of said equipment is, however, more crucial. The most common bow equipment available is compound bows and crossbows. Let us look at how the two fare against each other. Many bow purists do not consider crossbows to be bows. Some states that allow crossbow deer hunting have separate regulations for the bows. Their hunting seasons are usually shorter. Others, on the other hand, have similar regulations for both crossbows and compound bows. By all means, I recommend Compound bows when deer hunting. Unless a handicap or any other insurmountable odd demands a Crossbow, AVOID IT! Five factors make or break a deer hunting bow. The power stroke is the distance separating a fully drawn string from a string at arrow rest. The bigger the Power stroke, the faster an arrow flies. Compound bows offer greater power strokes than crossbows. Faster arrows carry more momentum than slower arrows. This increased energy increases an arrow’s probability of resulting in a quick kill shot. Increasing draw length increases the power stroke. A module change is all it takes to change a compound bow's draw length. You do not have to increase the bow’s size. On a crossbow, however, to increase draw length, you increase the bow’s size. Bigger bows are a nuisance to deer hunter for three reasons. a. Larger bows are harder to conceal. b. Larger bows are heavier to lift and harder to aim. c. Bigger bows tend to make more noise when fired. Noise is the last thing a deer hunter needs! Draw weight is the amount of energy required to draw a bow. Since crossbows have shorter draw lengths, they increase arrow speed by increasing draw weight. Increased draw weight is disadvantageous for two reasons. This extra strain eats away on the accuracy of the aim. A more relaxed draw is better when aiming at deer. The kill shot spots on deer are very precise. They demand very accurate shots. It is harder to make these shots while struggling to pull the string to full draw. 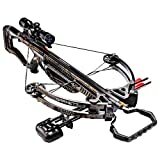 The draw weight is a major factor when looking for the best crossbow for deer hunting. Sometimes a deer will walk past a hunter. Such deer only offer a good shot for a limited amount of time. The bow hunter needs to take the shot as soon as it is availed. The area around the heart is still the best place to shoot a deer with a crossbow. Very few angles, however, result in kill shots in the area. Bones and muscles guard the area well. It is, therefore, crucial that the shot is taken immediately a good angle is availed. Bow hunting may demand that you follow deer through long distances. Mobile and shy species, like the whitetail, may demand you shift your location many times. Heavier bows make such long hunts very tiring. Crossbows weigh 2- 3 times more than compound bows. They are, therefore, less portable than their counterparts. Noise is the last thing deer hunters need. The higher draw weight of the crossbow usually translates to more noise. The only advantage that crossbows have over compound bows is the ability to lock a draw. The inclusion of draw-lock on compound bows, however, takes this edge off. Like I said earlier, when hunting deer, go for compound bows. The inclusion of cranks to draw bows is another disadvantage of the crossbow. These cranks are noisy and cumbersome. Deer will spot you before you spot them. Older deer will avoid the area altogether should they hear strange noises. Deer will also tighten their muscles when they detect the snap of a bowstring. They will go low and consequently evade kill shots. This tactic is known as 'jumping the string' in some circles. Most crossbow deer hunting tips require that you aim low to offset the jump. In short, noise from a crossbow can ruin the entire hunt for you. Kill shot zones are hidden and evasive. That is where to shoot a deer with a crossbow. The problem is the crossbow’s accuracy. When drawn and locked, string position is regularly compromised. This compromise increases the margin for error. Compound bows are, however, more accurate than crossbows. String loops and consistent anchor points ensure their accuracy. As you can see, compound bows maul crossbows on a head-to-head confrontation. These comparisons are why most skilled hunters use compound bows.